Watershed teams up with the Boothbay Harbor Rotary every spring to host a delicious meal with handmade ceramic bowls filled with all-you-can-eat chowder and soup, as well as salads, breads and desserts. Local restaurants and chefs generously donate the food. 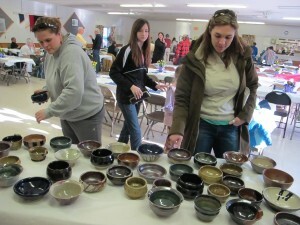 The colorful ceramic bowls, which diners get to take home, are made and contributed by Watershed artists, Maine potters, and high school student-volunteers. The evening also features a raffle, and many guests leave with gift certificates to local businesses. Proceeds benefit Rotary community projects and Watershed’s education programs. Come enjoy a delicious meal and support two valuable community initiatives. The 2019 Soup Bowl Supper will be held on Thursday, April 11 at 5:30 p.m. at the American Legion Hall, 25 Industrial Park Dr., in Boothbay (map). We suggest arriving a bit early for best selection of bowls.